Smoking Statistics in the U.S. and China – Jeremy S. Wu, Ph.D. The U.S. Surgeon General released a landmark report on smoking and health in 1964, concluding that smoking caused lung cancer. At that time, smoking was at its peak in the U.S. – more than half of the men and nearly one-third of the women were reported to be smokers. A time plot based on the recent report  shows the trend of one statistic – adult per capita cigarette consumption – for the period of 1900-2012. It reveals the rise of smoking in the U.S. in the first half of the 20th century, coinciding with the Great Depression and two world wars when the government supplied cigarettes as rations to soldiers. There has been a steady decline in the last 50 years. When the 1964 report was released, an American adult was smoking more than 4,200 cigarettes a year on the average. Today it is less than 1,300. About 18% of Americans smoked in 2012, down from the overall 42% in 1964. The difference between male and female smokers is relatively small – men at 20% and women at 16%. According to a 2013 Gallup poll , 95% of the American public believed that smoking is very harmful or somewhat harmful, compared to only 44% of Americans who believed that smoking causes cancer in 1958. After the release of the 1964 report, Congress required all cigarette packages to carry a health warning label in 1965. Cigarette advertising on television and radio were banned effective in 1970. Taxes on cigarettes were raised; treatments for nicotine introduced; non-smoker rights movement started. Together laws, regulations, public education, treatment, taxation, and community efforts have all played an important role in transforming a national habit to a recognized threat to human health and quality of life in the last 50 years. This was beyond my wildest imagination that it could happen in my lifetime. Statistics has been at the center of this enormous social change from the beginning of the smoking and health issue. During the past 50 years, an estimated 21 million Americans have died because of smoking, including nearly 2.5 million non-smokers due to second-hand smoke and 100,000 babies due to parental smoking. There are still about 42 million adult smokers and 3.5 million middle and high school students smoking cigarettes in the U.S. today. Interestingly, Asian Americans have the lowest rate of smokers at 11% among all racial groups in the U.S.
China agreed to join the World Health Organization Framework Convention on Tobacco Control in 2003. It reported  356 million smokers in 2010, about 28% of its total population and practically unchanged from its 2002 level. The gender difference was remarkable – 340 million male smokers (96%) and 16 million female smokers (4%). About 1.2 million people die from smoking in China each year. Among the remaining over 900 million non-smokers in China, about 738 million, including 182 million children, are exposed to second-hand smoke. Only 20% of Chinese adults reportedly believed that smoking causes cancer in 2010 . More detailed historical records on smoking in China are either inconsistent or fragmented. One source outside of China  suggested that there were 281 million Chinese smokers in 2012 and an increase of 100 million smokers from 1980. China has been stumbling in its efforts to control smoking. According to a 2013 survey by the Chinese Association on Tobacco Control , 50.2% of the male school teachers were smokers; male doctors 47.3%; and male public servants 61%. Given these high rates for their important roles, there is concern and skepticism on how effective tobacco control can be implemented or enforced. Coupled with the institutional issues of its tobacco industry, China has been criticized for its ineffective tobacco control ineffective. While the size of some American Tobacco companies may be larger, they are not state-owned. China is the world’s largest tobacco producer and consumer. Its state-owned monopoly, China National Tobacco Corporation, is the largest company of this type in the world. Nonetheless, the Chinese government has enacted a number of measures to restrict smoking in recent years. The Ministry of Health took the lead in banning smoking in the medical and healthcare systems in 2009. Smoking in public indoor spaces such as restaurants, hotels, and public transportation were banned beginning in 2011. According to the Chinese Tobacco Control Program (2012-2015) [9,10], China will ban cigarette advertising, marketing and sponsorship, setting a goal of reducing the smoking rate from 28.1% in 2010 to 25%. Smoking is a social issue common to both the U.S. and China. Statistics facilitates understanding of the status and implications, as well as providing advice, assistance, and guidance for governance. More statistics can certainly be cited about the ill effects of smoking in both nations. At the end, it is the collective will and wisdom of each nation that will determine the ultimate course of actions. U.S. Department of Health and Human Services. (2014). 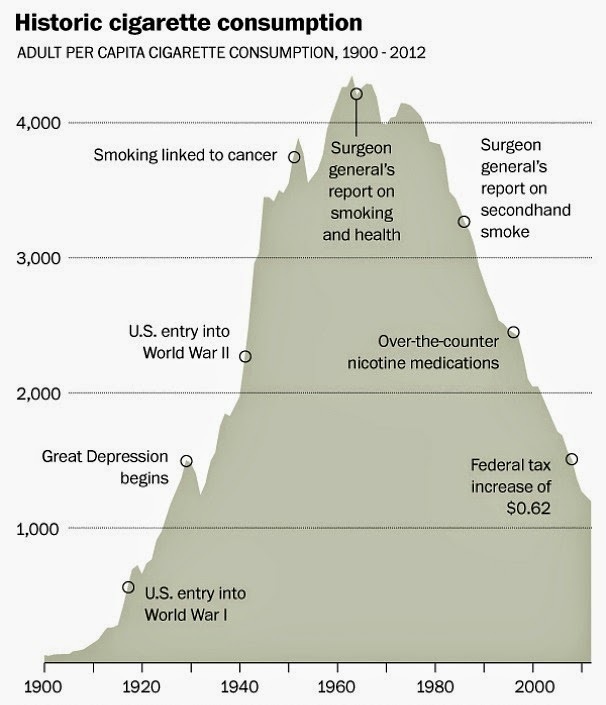 The Health Consequences of Smoking – 50 Years of Progress: A Report of the Surgeon General. Retrieved from http://www.surgeongeneral.gov/library/reports/50-years-of-progress/full-report.pdf. Ferdman, Roberto. (2014). The young and poor are keeping big American tobacco alive. The Washington Post. Retrieved from http://www.washingtonpost.com/blogs/wonkblog/wp/2014/07/16/the-young-and-poor-are-keeping-the-u-s-tobacco-industry-alive/. Gallup Poll. Tobacco and Smoking. Retrieved from http://www.gallup.com/poll/1717/tobacco-smoking.aspx. National Library of Medicine. Profiles in Science. The Reports of the Surgeon General. Retrieved from http://profiles.nlm.nih.gov/ps/retrieve/Narrative/NN/p-nid/58. The Central People’s Government of the People’s Republic of China. (2011, January 6) Population of tobacco remains high and not declining; smokers are still over 300 million. Retrieved from http://www.gov.cn/jrzg/2011-01/06/content_1779597.htm. Xinhuanet.com. (2011, May 2). New smoking ban effective in China. Retrieved from http://news.xinhuanet.com/english2010/video/2011-05/02/c_13855260.htm. Qin, Amy. (2014, January 9). Smoking Prevalence Steady in China, but Numbers Rise. The New York Times. Retrieved from http://sinosphere.blogs.nytimes.com/2014/01/09/smoking-prevalence-steady-in-china-but-numbers-rise/?_php=true&_type=blogs&_r=0. China News. (2013, December 31). Survey finds over 60% of male public servants smoke; half never quit. Retrieved from http://www.chinanews.com/sh/2013/12-31/5680798.shtml. The Chinese Ministry of Health. 2013 Report on Tobacco Control in China – Total Prohibition of Tobacco Advertising, Marketing and Sponsorship. Retrieved from http://www.moh.gov.cn/ewebeditor/uploadfile/2013/05/20130531132109426.pdf. China Women’s Federation News. Banning Tobacco Advertising Cannot be Just Paper Planning. Retrieved from http://acwf.people.com.cn/n/2013/0603/c99013-21712571.html. China Health Smoking Tobacco Control U.S.